Technology: Lapping Services are metal finishing services which use abrasives suspended in pastes or solutions to produce very fine finishes on machine parts. 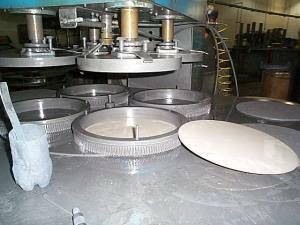 Lapping is used to improve parallelism, flatness, and surface finishes after grinding. It is a low speed process and well suited to thin parts because it generates minimal heat and consequently little distortion, so it can be done instead of grinding. Lapping is sometimes referred to as "free abrasive machining." Advantages: Lapping Services can provide very tight tolerances on flat parts and can also be used to improve the matching characteristics of mating parts such as engine valves and face seals.